Meet the newest Pokémon, Yungoos. The internet thinks he looks kiiiind of familiar. See the yellow fur on the top of his head? That’s what Pokémon fans are fixated on, and what is drawing all sorts of comparisons to Donald Trump’s famous hair on Twitter. There are countless number of tweets to this effect. We of course had to throw our hat into the ring, which is why the lovely Angelica Alzona drew up Yungoos on the campaign trail on the first image of this post. It’s almost too perfect, no? I’d totally vote for that guy. That razor-sharp smile inspires both confidence and terror! 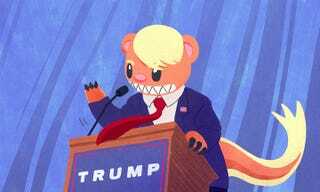 Yungoos is like a real politician already.